MJP TS BC Welfare 5th Class Admissions Counselling, Certificates verification dates, list of documents, MJPTBCWREIS V Class admission test counselling, TS BC Welfare 5th Class Entrance Test 2019 Counselling Schedule and Verification of Certificates: Telangana State Mahatma Jyothiba Phule BC Welfare Educational Institutions Society issued the MJPTSBCWREIS 5th Class entrance exam notification 2019 in January 2019. 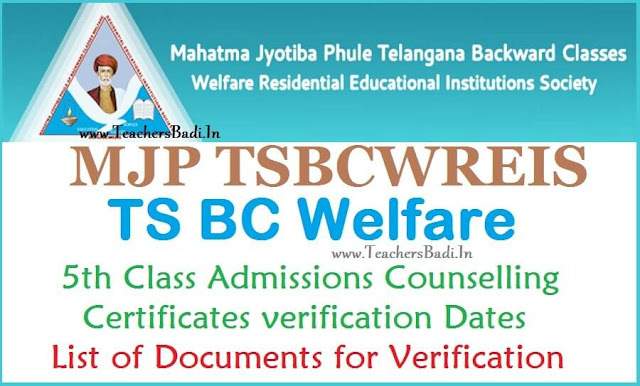 ThisTS MJP BC Welfare Entrance Test Notification 2019 for admissions into 5th class (English Medium) in TS MJP BC Welfare Residential Schools in the Telangana State for the academic year 2019-2020. The MJPBCWREIS invited online applications from the eligible 4th class passed students from 01/03/2019 to 31/03/2019 for admission into 5th class in its MJPTSBC Welfare Residential Schools. The eligible students were submitted their applications through online mode at mjpt bc welfare official online web portal and they were attended the exam. MJPTBCWREIS officials successfully conducted V class entrance test at all districts head quarters and also mandal level centers on ..-04-2019 and they has announced results and appeared candidates were checked their results on Telangana BC Welfare Gurukulam Web portal mjpabcwreis.cgg.gov.in. 11 Transfer certificate Original to be submitted at the time of admission. The TS BC Welfare Residential Schools 5th class admissions counselling would be conducted on 03/06//2019. District wise results and provisionally selected candidates list have been placed on mjpabcwreis.cgg.gov.in web portal. So, Candidates should download the Selected list and attend the first phase admissions counselling with your hall ticket and along with relevant original documents and 2 sets of xerox at counselling centre which was mentioned in your call letter on 03/06/2019 by 10.00 AM. So, All the students are instructed to attend to the counselling on ..-06-2019 from 10.00 AM at MJPTBCWR SCHOOL, Concerned your District with the required documents.